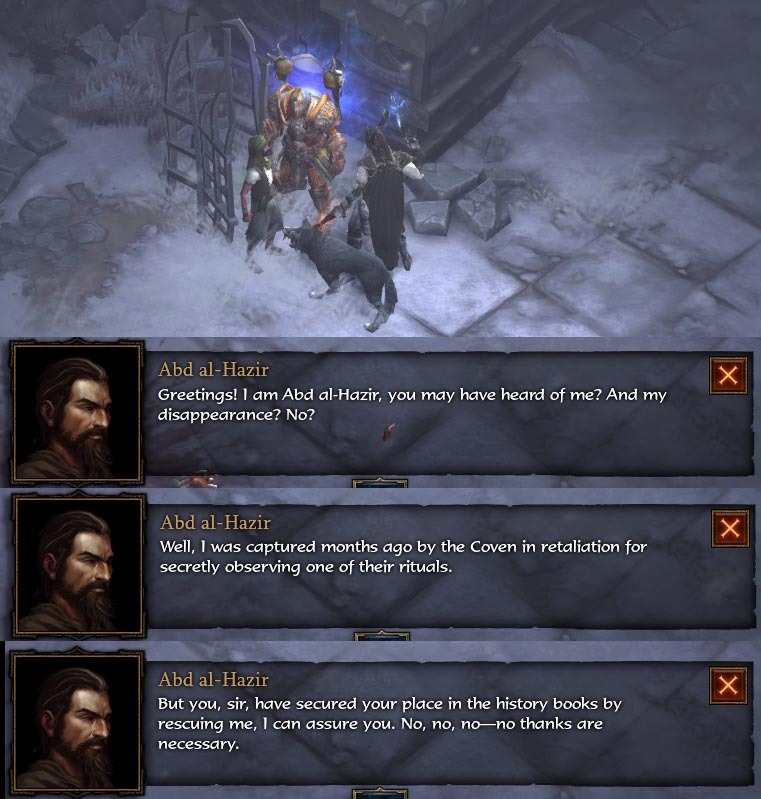 During Diablo 3’s development, much of the game lore was communicated via the writings of Abd al-Hazir, an in-game figure who was said to be an intrepid explorer devoted to creating an encyclopedia of Sanctuary’s many oddities. Blizzard posted dozens of short articles by Abd al-Hazir, and while they are no longer accessible on Blizzard’s site, you can read all of them in our DiabloWiki.net. Abd al-Hazir wasn’t just on the website, he’s heard in the game, as the author/narrator of many of the monster lore entries mostly from Act One. (Exceptions are mostly due to Bliz shuffling monster locations during final development. Details in comments.) He’s only lightly heard in the game beyond Act 1, and his last entry (#42) was a grim tale of running for his life after spying on a horrific Cultist ritual. Widely presumed dead, Abd al-Hazir has staged a miraculous return to the game, appearing as a chatty NPC who you can rescue during an event in the new Act Three area, the Ruins of Sescheron. Some players have asked spoiler warnings about the new content in Patch 2.3, so click through if you’d like to see screenshots of Abd and more details, including his dialogues when encountered. Abd is found in a random event in the new Ruins of Sescheron area. He’s locked in one of those iron cages you first see in and around Alcarnus in Act II, and surrounded by a great number of the arctic goatmen found in Sescheron. After they are killed his cage becomes clickable and he gives the following intro speech, and then has a second dialogue chain, all delivered in his self-aggrandizing style. He follows you around the Ruins of Sescheron once you rescue him, but does not make the trip back to town when you leave the area, and is not seen afterwards. (Some commenters say the saw him in town, but he was not clickable there.) I didn’t notice, but apparently al-Hazir does provide a new Sescheron lore entry as well. It’s possible we’ll see more of him once Patch 2.3 goes live, since the PTR might not have the full lore/story content. A compilation of Abd al-Hazir’s monster lore heard in-game. PTR Game Disconnects Continue: Fix Tonight? For some reason this makes me irrationally happy. He is of course heard in act 3… Wherever did you get the notion he is not? The Monster Lore entries in Act 3 are also voiced by him. Not all but some. Time for you to play some Campaign i guess. At least you could try to be a little more precise in you your investigations of Game Lore before you write an article. Take it easy Captain Furious. He can't even pay attention to the fact that the lore of one of the new monsters (ice porcupine I believe) is from him as well. Is this really SO important that you had to get butthurt over it? You realize this isn’t world history right? He’s allowed to be wrong. You are correct that I don't pay much attention to the monster lore pop ups. My background info about Abd was talking about how Blizzard presented him via their website in the 2009-2012 time frame, as a a world explorer and archivist. As his writings make clear, he explored Tristram and those regions extensively, and only lightly ventured into other regions, just enough to offer some class introductions. There is a Barb/Mt. Arreat mention, as well as a WD jungle mention, but those events are set well before events in the game, where Demon Lords come to Sanctuary and raise armies, etc. Basically as Bliz presented Abd, he explored the world in the years before D3, but saw monsters almost exclusively in the Tristram area before his disappearance. I'll clarify the wording in the post, but the monsters he lores about are all creatures originally set in Act 1; Golgor originated as the Thousand Pounder, succubi were found in the Cathedral during development, etc. Monsters got shuffled around a lot in the final game, rendering Abd's geographic clustering somewhat obsolete. Let me clarify. 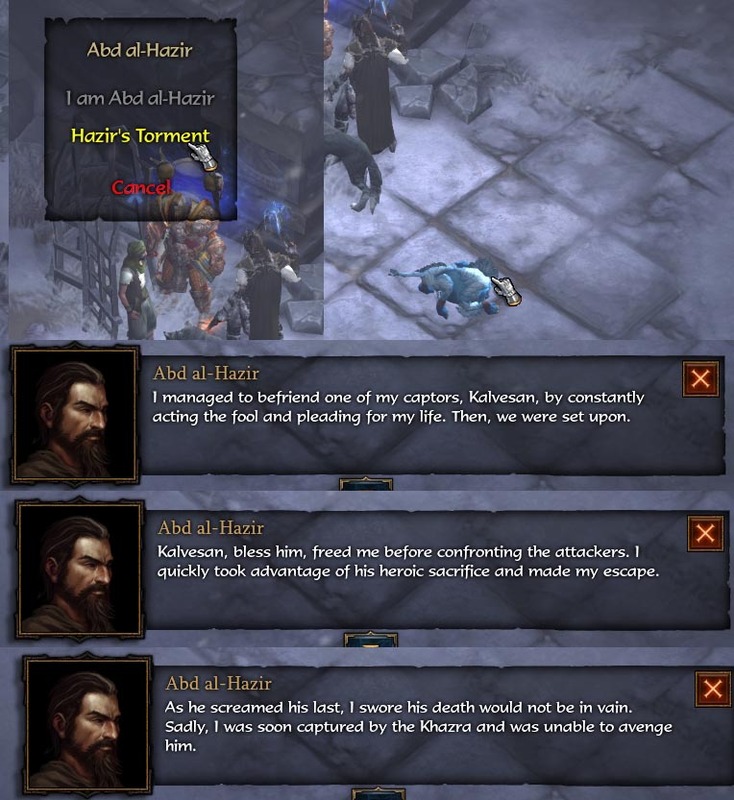 Abd al-Hazir was used by Bliz as a narrator and lore device on their website from 2010-2012 or so. In his writings, he was a world explorer who got around a fair amount in the years before D3, and he mentions the WD jungles and the Monk homeland and the Mt. Arreat region, but the bulk of his writing focuses on Tristram area, and almost all of the monsters he wrote about were (originally) located in Tristram. Succubi were in the Cathedral, Thousand Pounder was the original Golgor, etc. 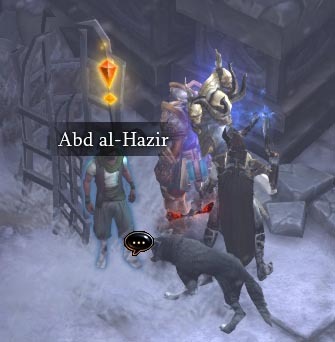 As presented by Bliz, Al-Hazir vanished shortly before events in D3 began, after witnessing a Cultist ritual, so he had nothing to say about Diablo's return, the Skeleton King, or anything in later acts. During later development Bliz shuffled monsters around a lot, so al-Hazir's comments aren't grouped so geographically or thematically as they were developed. And yes, I probably know more about the Lore and story as developed pre-game than as presented in the actual title, where I mostly skip the lore pop ups and click the lore books just to make achievements ding. Sorry but I am not really intrested what Blizzard has shuffeled around during Developement the way things are integrated in the end counts, not the way it once was during Developement. And now (in the final Game and this means official) some of his Lores are in Act III – no buts anymore please. You nicely sidestepped the fact that he actually knows quite a bit about the lore of the game, proving your original claim wrong. A little more familiarity with current in-game lore wouldn't be a bad thing. It's often mildly amusing. And breaks the monotony. When I took a town portal back from the Ruins of Sescheron, he followed me in, mention something along the lines of he’s finally back, and then started walking around randomly. That was the last appearance. Did they adapt the name from Abdul Alhazred? The (fictitious) author of the (fictitious) Necronomicon. Would kinda make sense as an homage to Loveceraft. We've long assumed that's where they got the name. You don't see much of them in the current game, but there were a lot of Lovecraft homages and connections in the early Diablo 3 lore and monster design. And Bliz has Lovecraft references in their other titles. So there used to be downvotes on this site uh… ? Abd al-Hazir is voiced by Brian George, who you might remember as pakistani resturant owner Babu from Seinfeld, or more recently as Raj’s father on The Big Bang Theory.